Barcelona is a major global city. It is the second most populous city in Spain with a population of 1.6 million people. It is an important industrial center as well as Europe largest passenger port. In order to appreciate Barcelona, it is important to understand that Barcelona is the capital of Catalonia. Today, Catalonia is an autonomous region of Spain but for much of its history, it was independent. It has its own culture and language, which is not only one of the region's official languages but also widely spoken in the city. There is also a strong independence movement. As a result, Barcelona does not have the same look as other Spanish cities. Yes, there is a Spanish influence but the wide tree-lined streets are more reminiscent of Paris than of a Spanish city. 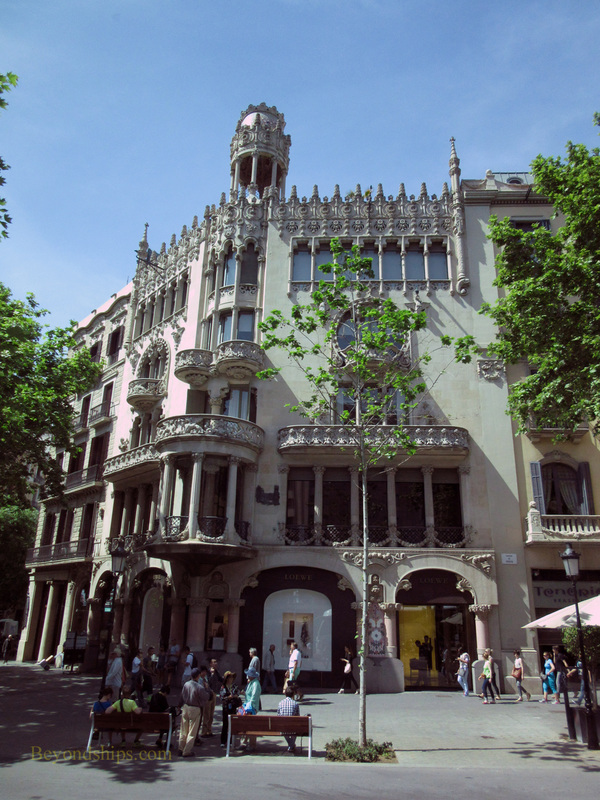 Furthermore, Catalonia has more than 2,000 examples of Modernisme architecture, Barcelona's unique style of Art Nouveau. In addition, as a trading port, the culture of Barcelona has been influenced by the commerce both in goods and thought from other countries. It has developed a reputation for innovative ideas perhaps best symbolized in the unique architecture of Antoni Gaudi. Freed from the repression of the Franco regime, this aspect of Barcelona's character has once again become apparent. There is a wide range of things to do including shopping and various forms of entertainment. Barcelona also has museums, architecture, art and historic sites. Barcelona has a mild climate situated as it is in northeast Iberian peninsula between the Mediterranean and the Pyrenees. The currency is the Euro. The Official languages are Catalan and Spanish. 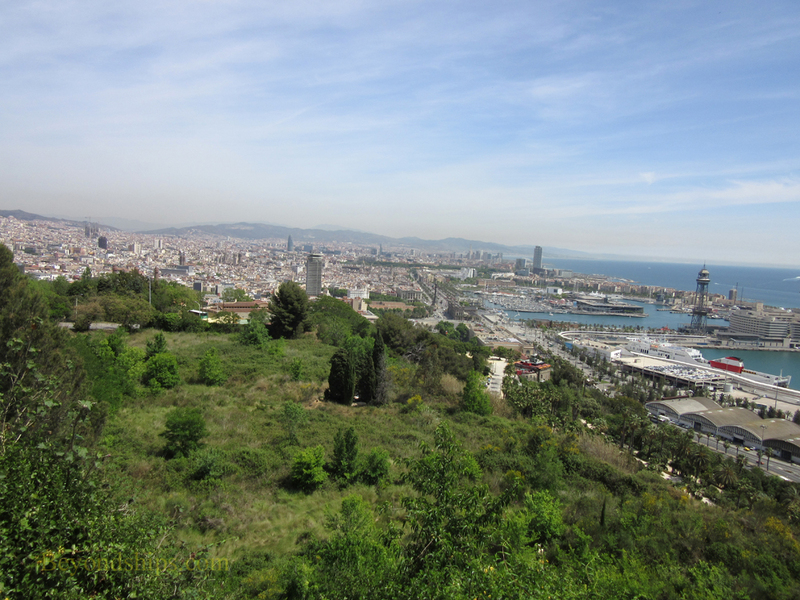 Above: Looking doen from Montjuric towards Palaca d' Espana. Below: Barcelona is known for its architecture. It is said that Barcelona was founded by the mythological hero Hercules but others claim that it was begun by the Phoenicians and the Carthaginians. In any event, by the first century BC, there was already a Roman city. After the fall of the Roman Empire, Barcelona was conquered by the Visigoths and it became their capital. The Visigoths were followed by the Moors who occupied the area for 100 years but their influence proved not as long lasting as elsewhere in Spain.. In 988, however, Count Borell II succeeded in making the County of Barcelona independent. Over time, the counts absorbed the surrounding area creating the country of Catalonia. As the result of a royal marriage, Barcelona merged with the kingdom of Aragon. The resulting kingdom became an economic powerhouse with influence over much of the Western Mediterranean. Another dynastic union took place in 1469 when King Ferdinand II of Aragon married Isabella I of Castile. This couple was the Ferdinand and Isabella who drove the Moors from their last stronghold in Spain and who subsequently sponsored Christopher Columbus' exploration of the New World. Indeed, Barcelona is where the royal couple greeted Columbus on his return from his first voyage in 1493. Following this union, however, political power in Spain shifted to Madrid and Barcelona went into a decline. In the 17th century, Catalonia, with the support of France, declared its independence. However, the only real winner in this conflict was France, which managed to take over part of Catalonia. 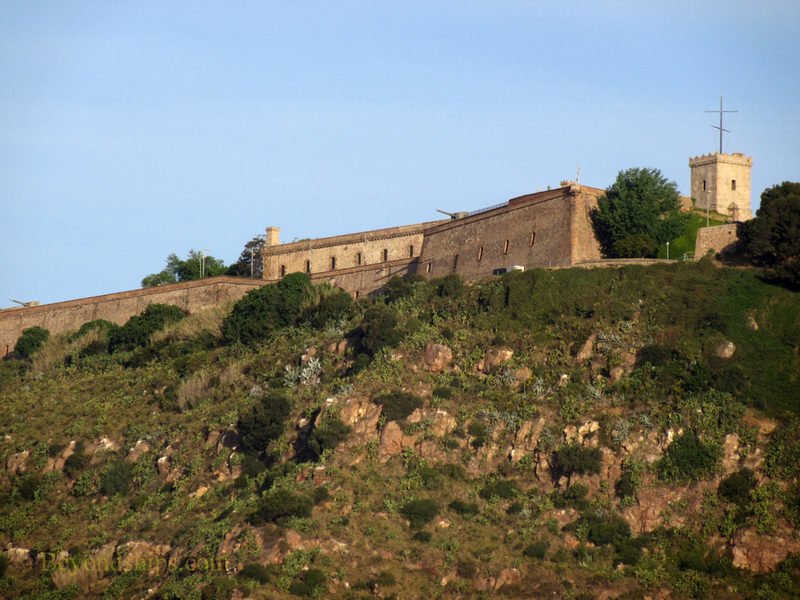 Above: The fortress on Montjuric overlooking the harbor. On this site, measurements leading to the offical meter were taken. Barcelona was occupied by the French under Napoleon at the beginning of the 19th century. However, after the fall of the French Empire, Barcelona was returned to Spain. The industrial revolution brought increased prosperity to Barcelona. In 1880, the city displayed this prosperity to the world in an international exhibition. It again held a world's fair in 1929. Vestiges of both of these exhibitions can still be seen in Barcelona. In 1932, Catalonia achieved autonomy within Spain. However, Barcelona was hard hit shortly thereafter by the Spanish Civil War. It supported the Republican cause but as the struggle progressed, first anarchists and then communists gained control of the city. Barcelona's opposition to the fascist-backed General Francisco Franco had repercussions when Franco became dictator of Spain. During his rule, the president of Catalonia was executed, the autonomous institutions of Catalonia were abolished and the Catalan language was banned. Following the death of Franco, Barcelona has once again flourished. 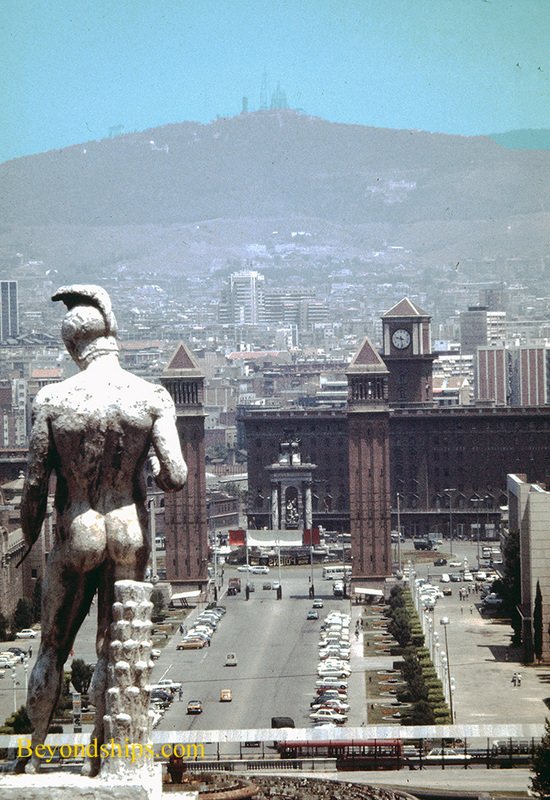 In 1979, Catalonia again became an autonomous region within Spain. World attention was focused on Barcelona in 1992 when it hosted the Olympics.